Two hundred astronomers from around the world will meet in Washington, DC on October 7 and 8 to discuss exciting new science to be done with the Atacama Large Millimeter Array (ALMA). The conference will be held at the Carnegie Institution of Washington (CIW), 1530 P St. NW, and is sponsored by Associated Universities, Inc., which operates the National Radio Astronomy Observatory (NRAO) for the National Science Foundation (NSF). ALMA will study the structure of the early universe and the evolution of galaxies; gather crucial data on the formation of stars, protoplanetary disks, and planets; and provide new insights on the familiar objects of our own solar system. 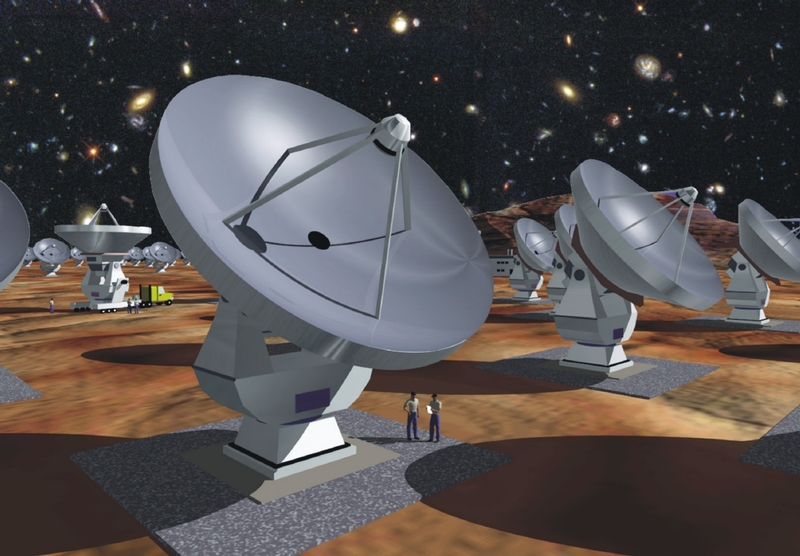 The array, expected to consist of 64 telescopes with 12-meter dish antennas, will be built at a high-altitude, extremely dry mountain site in Chile's Atacama desert in the next decade. ALMA is an international partnership between the United States (National Science Foundation) and Europe. European participants include the member states of the European Southern Observatory (Belgium, Denmark, France, Germany, Italy, the Netherlands, Sweden and Switzerland), the Centre National de la Recherche Scientifique (France), the Max-Planck Gesellschaft (Germany), the Netherlands Foundation for Research in Astronomy, and the United Kingdom Particle Physics and Astronomy Research Council. The project is currently in a Design and Development phase governed by a Memorandum of Understanding between the United States and Europe. It is hoped and expected that Japan will also join the project as a third equal partner. Negotiations are currently underway to add Canada to the United States team and Spain to the European team. "The ALMA partners from the U.S. team, the European team, and hopefully Japan, will form the world's first truly global astronomical collaboration," said Dr. Riccardo Giacconi, President of Associated Universities, Inc., "and together will build a magnificent millimeter/submillimeter observatory for the world astronomical community." At the Washington conference, scientists will describe in detail ALMA's capabilities in studying galaxies from near the time of their formation to the present; the detection and study of planets and disks around nearby stars; the study of star formation; and the study of the origin, distribution, and evolution of the elements and their isotopes. "ALMA will produce dramatic steps forward in our understanding of objects as close as the planets of our own solar system and as distant as the young galaxies at the edge of the observable universe." said Dr. Paul Vanden Bout, Director of the National Radio Astronomy Observatory. "The purpose of this meeting is to plan how to maximize ALMA's scientific potential." A press briefing on ALMA will take place Thursday, October 7, at 10:30 a.m. EST in the Board Room at CIW. Participants in the briefing include: incoming President of the American Astronomical Society Dr. Anneila Sargent (Caltech), noted author Dr. Alan Boss (CIW Department of Terrestrial Magnetism), Dr. David Spergel (Princeton University), Dr. Robert Eisenstein (NSF Assistant Director for Mathematics & Physical Sciences), Dr. Catherine Cesarky (Director General of the European Southern Observatory), and Dr. Keiichi Kodaira (Director General of the National Astronomical Observatory of Japan). Dr. Anneila Sargent will deliver the conference keynote address on Thursday, Oct. 7, at 8:30 a.m. There is a complete schedule for the meeting, as well as abstracts of invited talks and poster sessions, at the NRAO Web site. The National Radio Astronomy Observatory is a facility of the National Science Foundation and is operated under cooperative agreement by Associated Universities, Inc.
CAPTION: Panoramic view of the ALMA site at 5000 meters (16,000 feet) elevation in the Chilean Andes. Such a high site located adjacent to the Atacama desert makes this one of the driest places on Earth. Free from the distortions caused by atmospheric water, ALMA astronomical imaging will be superb. (Simon Radford, NRAO/AUI). 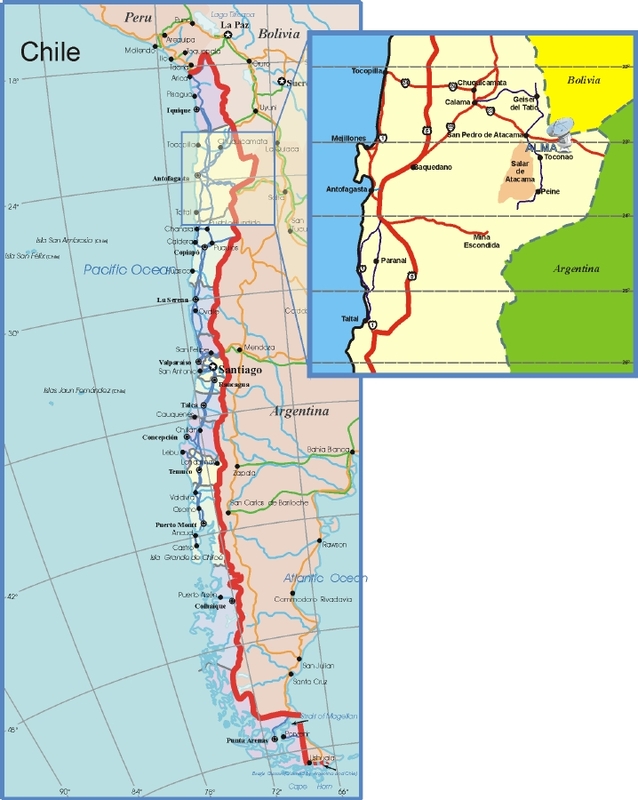 CAPTION: A map showing the location of the ALMA site in Chile. The magnified view of the site area includes the nearby international highway that provides access to the site. (NRAO/AUI). CAPTION: An artist's concept of ALMA. The array is expected to consist of 64 identical parabolic "dish" antennas, each 12 meters in diameter. The antennas may be moved, and the array reconfigured, so as to provide a "zoom-lens" imaging capability. Each antenna will be equipped with a suite of superconducting receivers for observations in wavelengths ranging from 9 to 0.3 millimeters. Images will be formed by numerically processing 64 gigabits of data received simultaneously from each antenna each second. (Artist's concept courtesy of the European Southern Observatory).